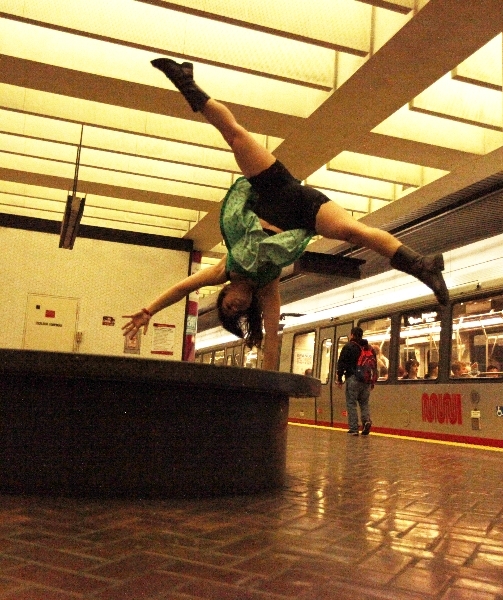 Each year for the last nine, Kim Epifano and Epiphany Productions/Sonic Dance Theater have engineered San Francisco sites on the SF Munitrolley system in order to deliver to audiences in distant neighborhoods an opportunity to watch unusual dance. This year, the downtown events were accessible and very good, but due to some problems on the T line, the distance events became impossible for me to view. On the steps of the Fifth Street Mint, Anne Bluethenthal and Dancers offered “Currency of Foregiveness,” an event for three dancers (Laura Elaine Ellis, Fredrika Keefer, and Nicole Klaymoon) and a singer (Melanie DeMore). To the songs “God Bless the Child” and “Balm in Gilead,” the dancers moved across and on the steps, evoking images of rich and poor. At the finale, “foregiveness” coins were distributed. A moving event. At Hallidie Plaza, Campo Santo, directed by Sean San José, brought delight to all onlookers perched above on Market Street and down in the Plaza itself. Six women danced break, hip-hop and moves while three men “shouted” through megaphones. As they moved through the tunnel on the way to Muni, many of the onlookers joined in. It was the essence of good times street dance. After a 45-minute ride on the T, changing trolleys and walking endless blocks, the events at Fourth and Channel Streets were impossible for me to attend. Among the performances were Carpetbag Brigade, Diamono Coura West African Dance, and “Where Are You From?” by Epiphany Productions. I love the Trolley Dances and what they bring to the community. And I sincerely hope that Muni and the T line will improve.